Like the famous statues at Bamiyan, the ancient Buddhist site at Mes Aynak in Afghanistan - situated on the ancient trading route known today as 'the Silk Road' - is a place of distinct historical and archaeological importance. And, like the Buddhas at Bamiyan, Mes Aynak is located in an area of modern political and economic complexity. And as such, Mes Aynak is a site under imminent threat of destruction. But this time the threat is not so much ideological as economic. The site, which is known to comprise several ancient Buddhist monasteries and adjacent settlements, is rich in sculptural and monumental remains of the finest Buddhist art and architecture. Its cultural significance is immense. In terms of 'world heritage' it is undoubtedly a site of great importance. Yet the meaning of the name – Mes Aynak – belies its problem; the name means “little copper well.” The site is known to sit atop a huge copper mineral deposit (recent geological surveys have shown that Afghanistan abounds in such mineral resources). In November 2007 a lease was granted to a Chinese mining company, granting them the sole rights to turn the entire area into a vast open cast mine. But in order to do so – the ancient remains of Mes Aynak will be completely destroyed, setting a worrying precedent. Several small teams of foreign and local archaeologists are now racing against time, trying to excavate and document the site. They are working in extremely difficult and dangerous circumstances in what is still a very unstable region, risking their lives on a daily basis, trying to salvage as much as they can – but it is an enormous task. On December 25th 2012 they have been told they must down tools and leave so that the mining works can begin. 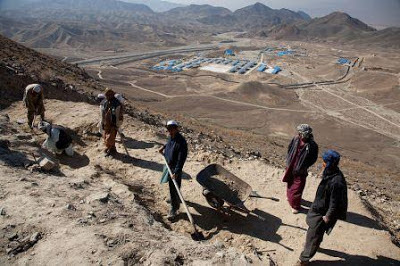 Whilst no one could argue that Afghanistan is not in dire need of real economic investment and assistance, it seems clear that the exploitation of such natural resources needs to be properly monitored and managed by the Afghan authorities. The copper deposits are certainly a resource which would benefit the much beleaguered country, but surely no matter how much copper is there – it will only ever be a finite resource. 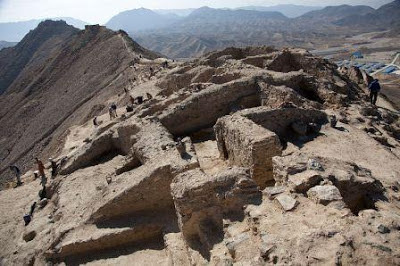 Whereas the archaeological remains represent a much more long-lived potential resource, the preservation of which would certainly be of great benefit not just to Afghanistan, but also for the whole world too. Despite the presence of the mining contractors there are genuine efforts currently under way to try and save Mes Aynak – but these efforts are still only small; more weight and momentum is needed. You can help in this effort. Find out more in this report recently broadcast on CNN with additional info here. Read about the work of documentary filmmaker, Brent Huffman and his involvement with Mes Aynak here and here. The photos illustrating this blog post were taken by The Times Africa Correspondent, Jerome Starkey (sourced from Wikimedia Commons), and more of his photos of Mes Aynak can be seen here on his Flickr page. UNESCO on Mes Aynak. You can also sign a petition asking Afghanistan’s President Hamid Karzai to help save Mes Aynak from destruction here. UPDATE: Here is an excellent piece just published in the NewYork Times by Andrew Lawler (December 23, 2012). There is also a second petition asking UNESCO to add Mes Aynak to its list of endangered world heirtage sites. Please sign this one too! FURTHER INFO: In 2011, to mark an exhibition of recent archaeological finds, the National Museum of Afghanistan in Kabul published this pamphlet illustrating the importance of Mes Aynak. Plus, the Central Asia-Caucasus Institute & Silk Road Studies Program has published a conference paper from 2012: Cultural Heritage vs. Mining on the New Silk Road? Finding Technical Solutions for Mes Aynak and Beyond. UPDATE: A recent and very informative article reporting on the current situation at Mes Aynak in Travel Culture Magazine by Michael Soncina (January 8, 2013). More info on the progress of saving Mes Aynak from the British & Irish Agencies Afghanistan Group (BAAG) website (January 14, 2013). The archaeologists there have been given more time, but pressure to save Mes Aynak still needs to be maintained. Emma Graham-Harrison: Mes Aynak Highlights Afghanistan's Dilemma Over Protecting Heritage in The Guardian (May 23, 2013). An excellent, balanced, and informed write up by William Dalrymple in The Guardian Mes Aynak: Afghanistan's Buried Buddhist Treasure Faces Destruction (May 31, 2013).